I’ve dabbled in the world of Peruvian Roasted Chicken. There have been a couple of spots like La Brasa and La Granja which I’ve enjoined thoroughly but everyone kept telling me about Tambo Grill. I remember seeing El Tambo Grill in the same strip mall where Rock that Burger is located, right off Sunset and 117th Avenue. 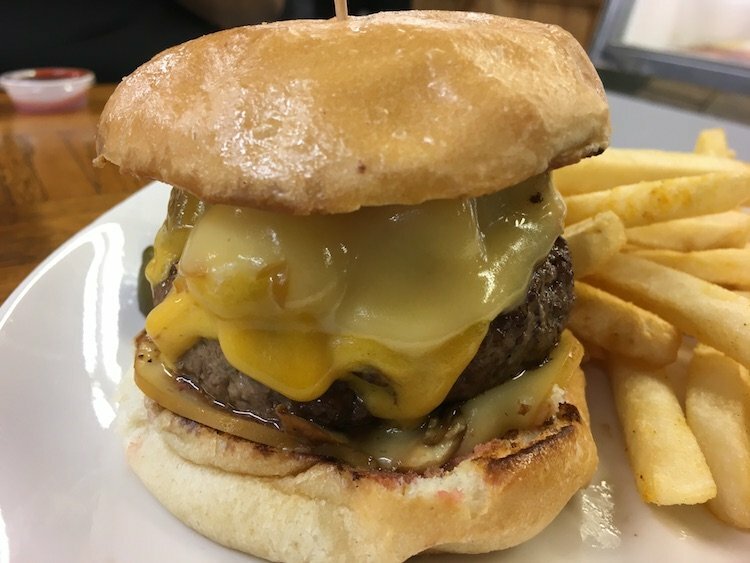 I was totally prepared to head that way and fight my best urges to grab a burger from Rock that Burger until I came across the “Tambo Grill” address in West Kendall. I took a look online and found that this “Tambo Grill” location was a more formal sit down restaurant with a larger menu. It looked like I could go crazy ordering a variety of dishes here, so I did. My wife Marcela was with me when I just went to town ordering a variety of plates to eat across the board. Once you’re a seated a helping of Toasted Cholo with a dipping sauce were brought to us. I enjoyed it but how exactly does one share this without double dipping your fingers in it? The Papa a la Huancaína, a dish I’m very familiar with is always a favorite. There are boiled potatoes under that tasty creamy sauce. The Chicharrón de Pollo are essentially mini hand-breaded Chicken Strips. You pretty much had to wrestle this plate away from me. The Chaufa de Pollo (Chicken Fried Rice) and Pollo a la Brasa (Roasted Chicken) were the one-two punch I needed in my life. There is something highly addictive about the marinade/stuffing of that chicken. Why can’t all roasted chicken be this good? Marcela’s dish was the Lomo Saltado, a stir fry with steak slivers, tomatoes and onions. I was lucky that she allowed me to even try it. The truth is, I still had one other dish that knocked it out of the stratosphere for me, the Churrasco en Salsa de Mostaza y Camarones. This platter is a Churrasco steak and Shrimp topped with a house-made mustard sauce. *I had just tried so much great food I wish I had left some more room to polish this one off. By the time the Mousse de Maracuya (Passion Fruit Mousse) and Chocolucuma (Lucuma Fruit mousse with chocolate on a crushed Oreo cookie crust) made it to our table, I was on life support. Marcela, who had behaved herself throughout was able to enjoy them. My suggestion? Order one main course and just enjoy it. It was nice to sample a variety of food but I would love to have eaten that Churrasco in mustard sauce in its entirety. I plan to listen to my own advice next time. *Carlos Piedrahita, the owner of Tambo Grill invited my wife and me to have a late lunch. They treated us to the meal. While it had no bearing on what I wrote, I needed to disclose that.